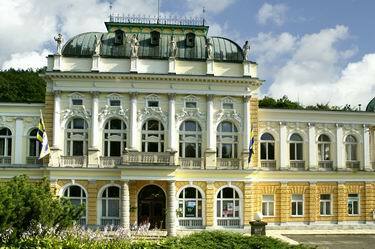 The traditional venue for the last few conferences - Marianske Lazne - offers conditions both for fruitful professional discussions and an excellent social background. The second largest Czech spa is known to be the largest and most beautiful city-garden in the Czech Republic. Located at the southern edge of "Slavkovsky les", a nature reservation in Western Bohemia, Marianske Lazne has been offering its hospitality and health power of some 100 wells (out of which 40 spring directly in the city) to the public already since 1818. The list of important visitors ranges from Edward VII, King of England, through composers (e.g. F. Chopin, R. Wagner, F. Liszt), writers (e.g. M. Twain, R. Kipling, N.V. Gogol), to A. Nobel and several Nobel Prize winners. The city offers a broad range of cultural, social, and sports events - it is the seat of Western Bohemian Symphonic Orchestra, its golf links are the eldest in the Czech Republic. Among the major attractions, a pseudo-baroque cast-iron colonnade with the Singing Fountain (musical and scenic illumination performances) can be listed. where most of the social activities will take place. The Casino conference centre is within walking distance from the majority of the hotels where the conference participants will be accommodated. Location of the Casino conference centre is shown on the map of Marianske Lazne.